Passing through the produce section of Costco, something strange caught my eye. Something unique. 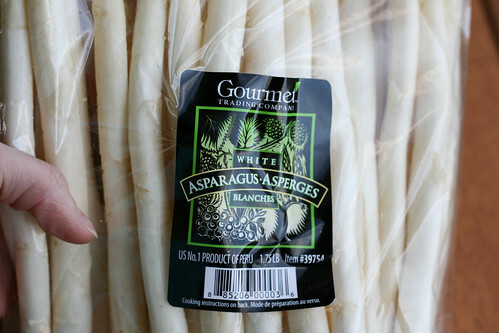 How can asparagus be white? Is this just asparagus that hasn’t ripened yet? Is the texture the same? With so many questions, we had to buy it. It was significantly cheaper than green asparagus (which should have been clue number one), but sometimes when Costco gets a new product they drastically reduce the price to get people interested in the product. The next day at work (we didn’t have time to make it that same day), I was telling a co-worker about our mysterious find. She told me that she’d had it before, and it wasn’t very good. (Clue number two) However, she had steamed her asparagus, and when I said we always grill ours, she thought it might make it work. We prepared it like normal (threw it into a bag with olive oil, fresh lemon juice and salt. Marinated for about 15 minutes and then grilled). And then? And then. It looked normal (with the exception of being white). It smelled normal. But it had the worst texture! It was soft on the outside and mushy on the inside. Like, so mushy I couldn’t bite it. So mushy I couldn’t cut it with a fork. So mushy, I couldn’t even cut it with a knife! We had to have undercooked them, right? So we threw them back on the grill. Five minutes passed. Then ten. After fifteen minutes, we figured they couldn’t possibly be mushy anymore. They had to have crisped, right? Did we overcook them? Undercook them? 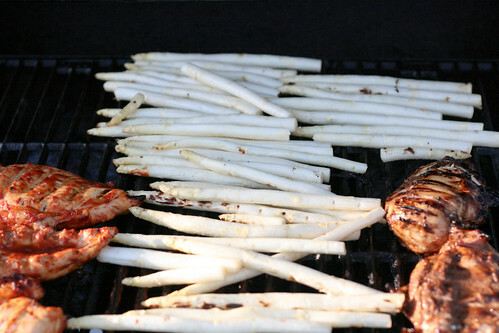 Is there some rule that says you shouldn’t marinate white asparagus? 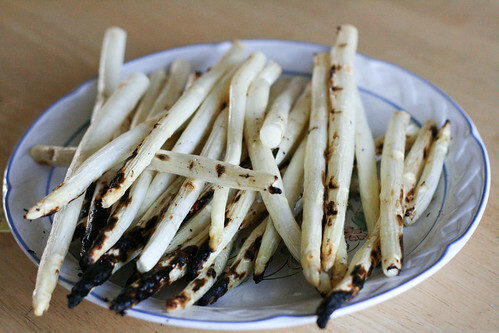 Or is the rule to just eat the lovely green asparagus and leave the white alone? Anyone? 1. The bag of asparagus did sit in our fridge for about 3 days. Could have been a factor. 2. The stalks were very thick. As a normal rule, we go for the thinner-to-medium stalks. Could have been a factor. I’m at a loss. How could asparagus go so wrong? lol! i like your epic fail label. now i want to try it, too! !